Rose Tattoo this week revealed that their new drummer is Jackie Barnes, 32-year-old son of Jimmy Barnes. A multi-instrumentalist, singer and songwriter who in 2010 graduated with a Bachelor of Music majoring in drum performance at Berklee College of Music in Boston, Barnes has toured with the Jimmy Barnes Band, blues funk Lachy Doley Group, classical pop The Ten Tenors and pop-rock performer Reece Mastin. Continuing their 40th-anniversary celebrations, Rose Tattoo today (Wednesday, August 29) kick off their second European tour for 2018, in Nürnberg in Germany. It takes in the UK, Belgium, the Netherlands and finishes off in France at the Raismes Festival on September 16. The current Tatts lineup sees stalwart singer Angry Anderson surround himself with guitarists Dai Pritchard and Bob Spencer (Skyhooks, Angels) and one time AC/DC member Mark Evans on bass. Barnes will make his Australian debut as a Tatts member when he returns with the band in late September. They embark on a run of Australian shows which begin on September 27 at the Corner Hotel in Melbourne and finish on November 3 at the Charles Hotel in Perth. After that, the new lineup goes into the studios to re-record the Tatts’ classic self-titled debut album. Produced by the Harry Vanda and George Young team and released through Alberts in November 1998, it was one of the most visceral debut albums of all time to be made in Australia. Tracks like Rock ‘n’ Roll Outlaw (which went Top 5 in France and Germany), Bad Boy For Love, Nice Boys (later recovered by superfans Guns N’Roses), Astra Wally and the 6 and a half minute epic working-class anthem Butcher And Fast Eddy became part of the Tatts legacy. 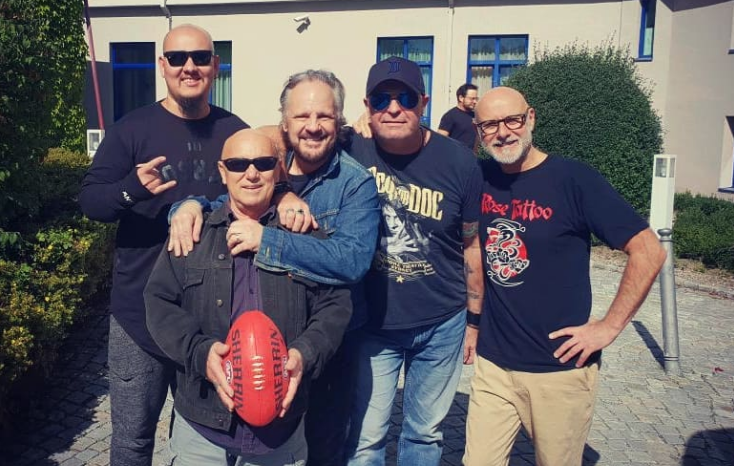 Angry Anderson says the re-recording is to mark what was “a pivotal moment” for the Tatts, and to honour the lineup which made that record. Aside from Anderson and former bassist Geordie Leach, all of the founding lineup has passed away. Slide guitarist Peter Wells succumbed to cancer in 2006. That year also saw the passing of Ian Rilen, who worked on the demos (he wrote Bad Boy For Love) but left to form the more extreme band X before the album was recorded. Also passed were guitarist Mick Cox (2009), drummer Dallas “Digger” Royal (1991) and George Young (2017). Rose Tattoo already plan to return overseas for dates in the northern summer, confirmed for German festivals Rock am Stück (July 18) and Wacken (August 1).